I recently bought a GoPro Session — those tiny, waterproof digital video cameras that you can strap onto your body. These cameras capture incredibly high-quality video, and the display at the outdoor store shows incredible video clips of surfing, cycling, skydiving, and, yes, fly fishing. Those clips gave me the notion of getting some shots of trout rising to my dry flies. Yeah, this camera is a First World solution to a First World problem. That said, modern fly fishing is the solution to all First World problems — at least for me. Anyway, I used the GoPro during an evening caddis hatch on Oregon’s Crooked River. When I got home, I downloaded two solid hours of wild rainbow trout rising to my Iris Caddis. I expected heart-pounding action on the screen, but I got sheer monotony. Angler (me) stares at water, rubs nose and puts fly in shake container. Shakes container. Anger takes fly out of shake container, stares at said fly and slowly, slowly wades a few feet to the right or left. Angler pulls line off reel, makes cast, stares at water while feeding out or taking in slack line. After a few casts — that all look the same — a trout comes up and eats the fly. The angler hooks the fish, reels in fish, stares at fish for a couple seconds and then lets it go. Each sequence was about five minutes long, but seemed like an hour. This was strange to me, as, in my memory, the evening was a heart-pounding session of non-stop Trout-O-Rama. I’ve always believed that time speeds up when the fish are eating our flies and slows down at other times, such as during a long meeting at work. But my little video on the Crooked River showed that time was, in fact, moving at the regular pace. And, of course, it showed why non-anglers believe angling is boring. I was surprised that my own, personal Trout-O-Rama wasn’t more exciting on video. The best moments came when a trout swirled on the smooth, glassy tailout water and sucked down my fly. That added up to about 12 seconds over two hours. The rest of the footage is pretty dull. Yet in my mind that evening was non-stop excitement, even though the video shows me moving around with the dynamic speed of an aged land tortoise. After watching my own, deadly dull footage, I spent part of an afternoon watching some fishing videos on YouTube and right here on MidCurrent. The best of these videos use amazing editing and tight shots to highlight the dynamic moments of fly fishing. The worst of those shows are only slightly less tedious than my own footage. My favorite stuff, by far, is from Todd Moen. Moen uses amazing camera angles — including footage from aerial drones — fast cuts, tight shots and music to capture and distill the most dynamic and meaningful moments of a long fishing trip into a short video. “Twilight Drakes: Upper Columbia River Fly Fishing” tells us a lot about the little-known brown drake hatch on the Upper Columbia River in seven short minutes. Moen, like all skilled filmmakers, makes time stand still. I’m eager to get up there and drift a massive dry fly to huge heads poking out of swirling, sucking backeddies. I believe short videos are best for fly fishing. I now believe our minds edit and manipulate hours of fishing into short, vivid memories — just like we see in those short videos. So, why don’t we get bored out of our skulls at the very moment we’re tying on a new fly or creeping along at a slow wade? Changing a fly for the sixth time or wading slowly looks boring on screen. But when we’re on the water we’re living in the moment and immersed in the fascinating world of fish. It’s hard to get bored when you’re living in a different, fascinating world. And we also have our imaginations working for us. In our minds, we’re imagining that big, rising trout — the one that has rejected everything for the past heart-stopping 30 minutes — will eat this latest fly and send electric jolts through our already jacked-up minds. In a sense, we’re constantly editing our mental footage of our fly-fishing outings. Our brains throw out the boring parts, or coat them in visions of what could happen, so time moves pretty fast. Then, probably on the hike back to the truck, our brains edit out the 20 minutes it took to fix the leader after two nymphs and three tiny split-shot turned into a tightly bound ball of monofilament. I guess this should bother me, but it doesn’t. I’m glad I go into a happy trance out on the water. That’s a big reason why I’ve fished like a maniac for my whole life. And why dwell on the dozens of bungled moments that are part of each day on the water? 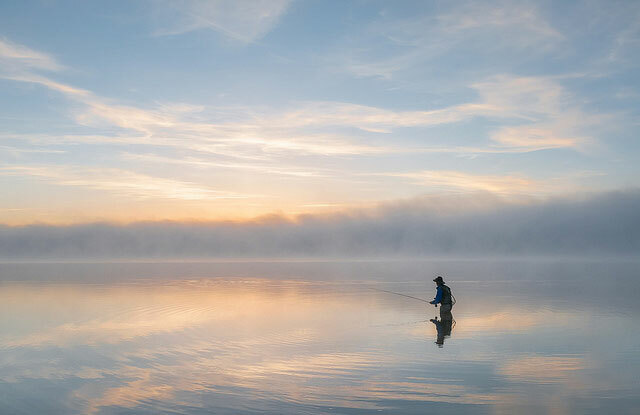 After all, memories are all that most of us take away from a day’s fly fishing. Well, there are those photos — and two hours of boring video to edit down to 12 seconds of heart-rattling action. Those 12 seconds are pretty cool.